On Sunday last weekend I flew out to CES to join the rest of my colleagues to exhibit Ubuntu at the show. We were there to show the full range of Ubuntu form-factors that we have available; desktop, TV, Ubuntu for Android, and most recently, Ubuntu for phones. 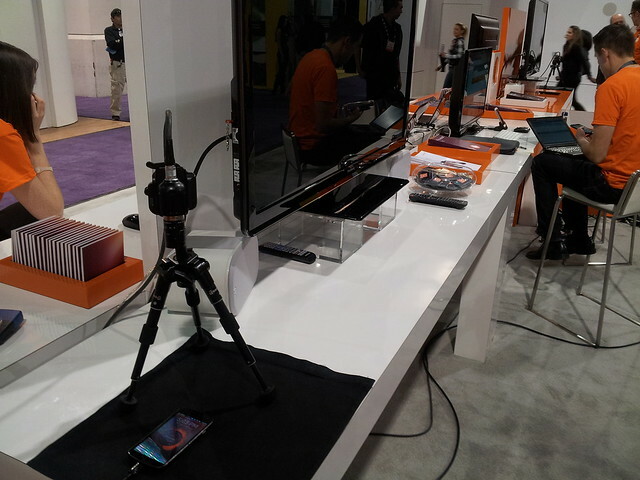 The Ubuntu booth was located in the South Hall within the cornucopia of screens and gadgets that is CES. The show is huge, really, really, huge, and one could be forgiven for thinking that Ubuntu would be a mere drop in the ocean when you have exhibitors such as Samsung and Sony with their warehouse sized booths. 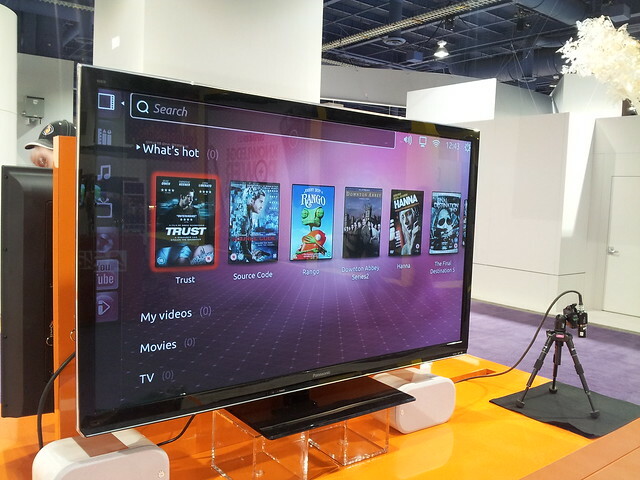 Fortunately, Ubuntu seemed to be one of the highlights at CES. Although many people were there to see Ubuntu for phones, the phone is really only one part of the true magic of Ubuntu’s focus and direction; a single ubiquitous convergence story that runs across every device you care about and the cloud. This is a story that is a lot clearer when you see each of these different form factors sitting side by side in the same booth, it really helped to connect the dots with our visitors. Ubuntu is about delivering a beautiful user experience that is perfectly tuned to the screen you are using, yet consistent in design and content across these different form factors. If you have used Ubuntu on the desktop, Ubuntu on the phone and TV looks and feels familiar. We have worked to build the content that you own (and the content that you could own) into the core of the platform, as opposed to it being buried in applications that you need to juggle to access it. We have worked to liberate web apps from the browser tabs that they are trapped in to integrate them with the core of the platform, and we have reduced the on-screen clutter that gets in the way of your content. Ubuntu One provides the connection points between these screens with your personal cloud in which your files, content, settings, and other content is neatly synced between all of your devices; as an example, if you buy or download a new song on your phone, it will sync effortless to your desktop, TV and other devices. This convergence presents a consistent design, user, and content experience across all of your devices, and underlined by Ubuntu; a platform that has a long heritage of openness and community participation. Our booth at CES was comprehensive. We had two large TVs with high quality cameras attached on either side of the stand where we did demos of the phone to interested passers by. In between these screens we then had stations for demonstrating Ubuntu for TV, Ubuntu One, Ubuntu for Android (which also demonstrated the Ubuntu Desktop), and the Ubuntu developer platform. Between these stations we gave out bags, t-shirts, literature, caps, DVDs, and other material. An Ubuntu for phones demo station. At the far end of the booth we also had our meeting room. With CES being a trade-only show, a primary goal for attending was to work with handset manufacturers and operators to explore how they can deliver Ubuntu to their customers. Mark Shuttleworth (founder of Ubuntu/Canonical), Jane Silber (CEO of Canonical), and Chris Kenyon (Head of Business Development at Canonical) spent most of their time in the meeting room talking with potential customers. Fortunately, their calendar was packed throughout the week with meetings and great progress was made. I spent most of my time at the booth presenting the phone on the big screens to the crowds that visited us. Now, I am not using the word crowd here in an exaggerated sense either – the Ubuntu booth was packed throughout the week, and most people who I spoke to told me that one of the main reasons they came out to CES was to see Ubuntu and in particular to see Ubuntu for phones. We saw a constant stream of visitors throughout the show. We also had a huge number of press come along to the booth and myself as well as many of my colleagues did countless demos both on and off camera to these members of the press. Speaking of press, I was delighted to finally meet Timothy Lord from Slashdot and I did a short interview and demo with him. I saw that a video of one of my demos is available online as well as some questions about the phone that I answered. Also, be sure to see SJVN’s write up about Ubuntu for phones. I have done trade-shows before, and I have exhibited Ubuntu many times at these shows. Although I had never done CES, I had done something similar in style and size (CeBit in Germany), and I had a broad idea of what to expect. Fortunately the show more than surpassed my expectations. We were absolutely inundated with people, and every time I gave a demo of Ubuntu for phone the audience smiled with interest as I walked them through the different features of the phone. Ubuntu for phones was very, very positively received, and from a “things often go wrong when demoing at trade-shows” perspective, we didn’t experience a single crash or failure with the phone (or anything else that we demoed). The only problem we had was rather flakey Internet access which impacted me demoing the deep integration of websites and social media into Ubuntu for phones. We also had a few other fun things happen. The week set off on the right foot when we won the Editors Choice award at CES from Popular Mechanics magazine, and we also had will.i.am from the Black Eyed Peas show up to see the Ubuntu phone. We were also expecting MC Hammer to visit us, which unfortunately didn’t happen, but infamous hacker Kevin Mitnick did make an appearance, to which my colleague Michael Frey and I swooned like Justin Bieber fans. The team holding the Popular Mechanics award. All in it was a tremendously productive and positive week. I have never been so excited to be part of Ubuntu and part of this convergence story that we are creating. Not only is this a great opportunity for Ubuntu, but it is a great opportunity for Open Source and Free Software, which continue to drive the ethos and values that form Ubuntu. Everything that we exhibited at CES is Open Source, and our community are a core part of how we build this platform and bring it to the masses. We have the potential of building a an ubiquitous platform that is simple and elegant for anyone to use, but driven by the values of Free Software. This is what freedom is all about; freedom of technology, freedom of choice, and freedom that is accessible to everyone. Let’s do this. Those shirts were just the ones we wore on the booth – they are not available to buy unfortunately. I have an (older) bright orange Software Freedom Day T shirt. my orange colours are not fast at all! Beware! depending on the dye. Mine is washed only in cold water!! The iRobot thing above your heads: does it mean that the next step is Ubuntu for Roomba? As a side not, is there any reason to keep the UO server closed? I mean, most people won’t bother installing a custom instance and/or configure their system to use an other server. So I don’t think Canonical may lose a lot of money if UO was opened. And I’m sure it would motivate the community in these times of FUD around Ubuntu. Is this because the Launchpad opening was a bad experience for Canonical? OK, so sure, one tiny component of a server side component in closed. Everything else – Ubuntu across the different platforms is Open Source, so is Launchpad, Bazaar etc. As for why it is closed, I am not sure why. I just don’t think it is that high of a priority. As for Launchpad, Open Sourcing it wasn’t a bad experience – it was positive for the company and for the community. Sure, it’s not high priority. But it would be nice to have (one less, relevant, argument for the anti-ubuntu out there). But throwing code over the wall isn’t a solution either, we would have to commit resources to making it easy to install and deploy, keep packaging up to date, etc. Things we don’t currently have to do with it all internal. It wouldn’t be hard to replicate the server side code. It’s not substantial. Just got to have a determined reason to do it. I like how classy the Ubuntu gang at CES seemed. No booth babes and good mixture of gender. Perhaps more racial diversity as well next time as well in reflection of the community? Just pointing out that Canonical has employees like Bilal Akhtar. Ah. Misread his G+ Profile. “Worked at” not “Works at”. I’m feeling that some technology to share data between machines on a local network would be useful around about now. also some common database interface or something better than desktop-couch (defunct) for sharing configurations and user data. Its still not fundermental enough. It looks far too much like an add on and not enough like a core service. Less u1 and more ubuntu please. I’m disappointed that Ubuntu doesn’t play nice with my Acer.. 🙁 I really wanted to keep with the tradition…. Oh well. I really can’t wait for the Phone! Has me stoked! Can we have a similar expo at our place as well? It would be a great and a bigger market to present. I too wish we had an expo in India at Mumbai or Bangalore. It is a sad fact that no major open-source companies conduct an expo in our country. Microsoft is better at that. They even go to colleges around Tier-II cities for their Windows Phone and stuff. The ill-effect of being such a big market is they never sell pure Nexus devices either. Had to get a Galaxy Nexus from grey market 🙁 Waiting for people to test the Ubuntu Phone OS. If they do not brick their phones I will test it out too. Purchased a Galaxy Nexus just to use this OS. Fantastic work. I have waited years for this. How many non-Canonical members of the community went with your team? Were any Locos involved maybe Nevada or Arizona? I support Ubuntu to the fullest and envy every person that works there. Great team, great people. Before some days ago, I wished to have a bigger screen for Ubuntu; now I wish to have a tiny screen for it! 😉 Love you guys. Seriously that orange shirt start selling it now. It look way better than the current line of Ubuntu T-Shirt. I’ve been wanting to hear more about Ubuntu TV and until you mentioning it here, I didn’t even think you guys brought it to CES this year. Old news I guess. Any news when there might be anything released that developers could play with? I want to be able to connect my open source DVR backend server – the Ubuntu TV 10 foot interface looks awesome and way better than my own. Ubuntu TV is great project! So how did the Cannonical crew spend its evenings in Las Vegas? Or was everyone just totally exhausted and just wanted to get some sleep? I recently put several Ubuntu-stickers on the back of my car in order to support you locally. Think about blogging/vlogging about how to use Open Source and why – but no quite sure yet. Can’t wait for ubuntu running on my smartphone! Is it already possible now? Would I be able to sync it with google cloud data? Meanwhile articles about the ‘Ubuntu phone’ can be found everywhere in german media, for instance on the famous spiegel.de. It seems to me that GNU-Linux and esp. Ubuntu on desktop, the phone and other devices will massively spread in the next months. Looks like a new hype, isn’t it? Your demo is the most complete I found about Ubuntu phone, great !